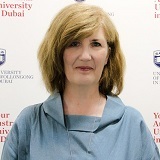 Dr Debra is part of the Executive Leadership team at UOWD, she oversees, leads and manages the strategic and operational business activities of the new UOWD College to achieve superior financial and quality outcomes for the success of the College and the University. Dr Debra McDermott has over 18 years of experience in the field of Education and Training in diverse markets both Europe and Middle east. She has vast experience in the management of English language, Diploma and Foundation programs. Debra has worked previously in The British Council, The Higher Colleges of Technology, Sharjah and the Algonquin College in Kuwait where she was the Head of Academics. Debra holds a Doctor of Social Science degree from the University of Leicester (UK) and an M.Ed. from the University of Sheffield (UK) and various management and teaching qualifications.